A glycolic acid exfoliating cleanser with hydrating glycerin that’s gentle enough for everyday use. Enjoy the double benefit of a refreshing, exfoliating cleanse plus hydration to put your best face forward every day. 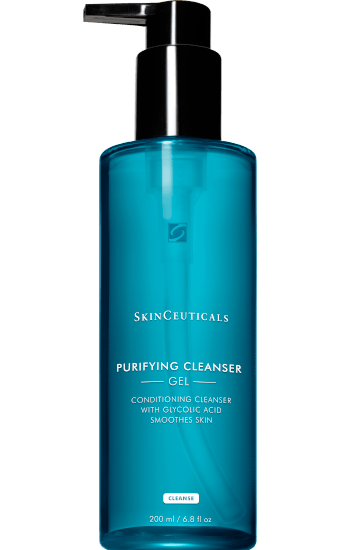 SkinCeuticals’ Purifying Cleanser is a gel formulation with mild foaming action that uses a 3% concentration including glycolic acid for light exfoliation and glycerin to keep skin soft and hydrated. It’s free of parabens, sulfates, soap, fragrances, dyes, or alcohol, making it non-irritating and perfect for all but the most sensitive skin types. Enjoy brighter, smoother, renewed skin when you use this cleanser daily. Directions for Use: Massage a small amount thoroughly over your wet face and neck in a circular motion, allowing it to foam. Rinse thoroughly with warm water and pat dry. Use twice daily in the morning and again in the evening before following with the rest of your regimen.